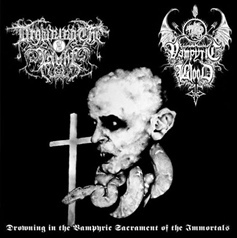 Released in early 2012, just a short time before Ordo Dracul, this split features three songs from the occult Finnish Black Metal project known as Vampyric Blood. The other band featured here is inferior and unworthy of mention. Despite such an unwanted presence, this recording is still notable for the contributions of Lord of Shadows. The sound is similar to that of the band's debut L.P. in that it possesses somewhat of a distant and cacophonous sound that might take a few moments to adjust to, much like any old '90s demo tape. The guitars and vocals are rather raw and harsh, in contrast to the warmth and clarity of the synth parts. Generally, I dislike keyboards, but I don't mind them if used properly (and sparingly). Overall, the sound here really suits the atmosphere and style of the material. The first two Vampyric Blood tracks, utilize fast-paced tremolo riffs, while still managing to include slower sections within each song, particularly the former. Of the two, "Grim Tyranny" really seems to stand out and is the most varied track on here. It does well to seamlessly transition between the mid-paced riffs and the faster guitar melodies, making for a rather engaging song, while never losing the lugubrious aura. However, the third composition from Lord of Shadows is the best one on here. "In Sorrow & Misery" is an eight-minute dirge that really lives up to its title. While alternating between open-arpeggios and faster tremolo picking, both the overall melody and drumming dictate a slower pace. This woeful track reaches right into your chest and takes your weakened heart within its strangling grip. The style hearkens back to older works from Burzum and Strid, possessing an unquestionably morose atmosphere. Though Drowning in the Vampyric Sacrament of the Immortals was limited to 1000 copies, it's probably that one can still track down a copy. Whether or not you are a fan of the other band on this split, the Vampyric Blood material is well worth hearing, especially "In Sorrow & Misery". This is some of the best raw and gloomy Black Metal that I've heard in ages, so it is very much recommended. 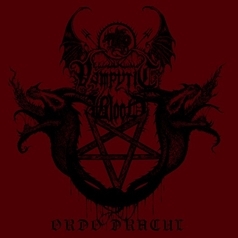 Ordo Dracul, released in 2012, is the first full-length album from Vampyric Blood, an obscure and mysterious Black Metal project from the cold forests of Finland. One would assume that the band's name was inspired by the Crimson Moon album, and there are also a few aural similarities. I initially thought this to be yet another creative outlet of the prolific Werwolf, of Satanic Warmaster, but he denied any connection. Regardless of the composer's identity, what one will find here is raw Finnish Black Metal that maintains the traditions set by those who came before. This album clocks in around half an hour and consists of only five real songs, along with an intro and an instrumental. These compositions work best within the context of the album as a whole and there is a great sense of continuity from beginning to end. Ordo Dracul possesses an immensely dark and gloomy atmosphere. The music has a distant quality, reminiscent of some old Moonblood rehearsals, sounding as if it was recorded in the next room. The keyboards, however, are a bit higher in the mix, in a similar manner to Crimson Moon's debut album. That said, what Lord of Shadows has here created is far more organic. A few of the riffs would fit in quite well on some of the early records from Horna or Satanic Warmaster, yet there are also some quite eerie and otherworldly guitar melodies that will haunt your mind, such as those found in "Black Sorcery of Wallachia" and "Gloom of the Eternal Night". There is a sombre feeling that permeates most of the material, which is accentuated by the raw demo-like production. Upon first listen, it may be difficult to fully discern what is going on, as the cymbals, keyboards and vocal echo create sort of a clattering, but it does not take long to get used to the peculiarities of the recording. There are moments where a clean/gothic 'vampire' voice is utilized, but it actually works well here. For example, "Gloom of the Eternal Night" and "Satanic Wraith of the Night" benefit from the limited melodramatics. This is one of the very rare cases where such a tactic actually works, as it doesn't sound forced or cheesy. Throughout the album, there is a growing feeling of deep and overwhelming misery, exemplified by the melancholic notes that close out "The Sanguinary Scent at Dusk". While several of the songs feature slower, down-tempo sections, it isn't until the lifeless and depressive final track, "Devotion & Despair", that the dreary feeling conveyed by these sorrowful melodies completely sink in and overtakes you. The utter hopelessness and grief conveyed here almost seems to drain every bit of energy from you, leaving you empty and lifeless. Over three years have passed since the initial release of Ordo Dracul and, as of yet, there has been no follow-up in the form of an L.P. Hopefully, this does not remain the case for very long. Lord of Shadows has done well to continue Finland's ongoing tribute and preservation of the raw Black Metal sound of the mid-90s, while still coming across as genuine and possessing somewhat of a unique feeling. This album would likely appeal to fans of early Mütiilation and Moonblood. While it may not compare to those that came before, it should satisfy those that seek more music in the same vein. Definitely give this a listen.